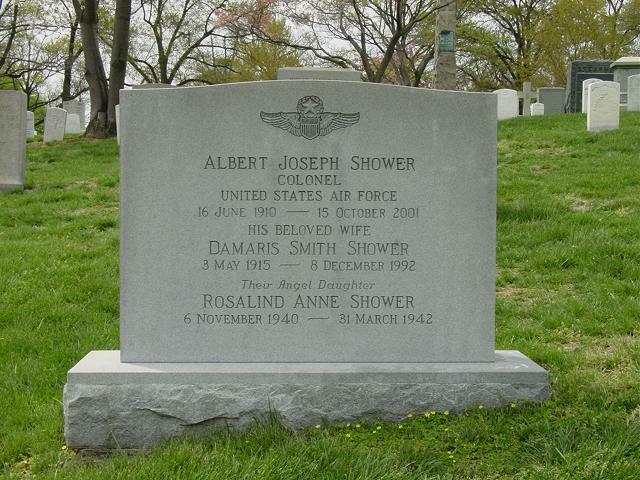 Colonel Albert J. Shower passed away Monday evening at 1830 hours on the 15th of October 2001. The Colonel had been having his good and bad days the last few months and yet he was very determined that he was going to England for the 2nd Air Division Convention. Mrs. Shower, Charlotte, and his son, Jay, were at his side. A Rosary was said on Friday, October 26 in the Chapel at Air Force Village West and a Memorial in the Convocation Room of Air Force Village West on Saturday, 27 October. Colonel Shower was 91 years young on the 16th of June this year. He was extremely active in all his associations with our Bomb Group, various honor societies, veteran groups and community organizations. He is survived by his loving wife, Charlotte, son, Albert Joseph (Jay) Shower, Jr., 2 daughters, Katherine Tittman and Holly Rusinak, sister, Esther Touchen, 8 Grandchildren and 13 Great-Grandchildren. 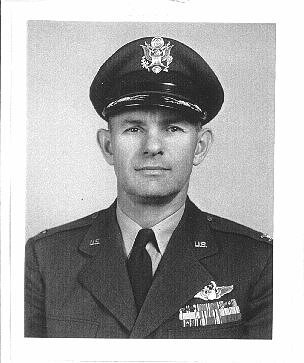 Colonel Shower was laid to rest on Friday, November 16th at Grave Number: 2225-A, Section 3, on McKinley Drive at Arlington National Cemetery. Our Commander will never be forgotten. He will live with us through the rest of our lives. The only way to truly show our respect is to say, "Thank you Colonel Al Shower for all you've done for us".